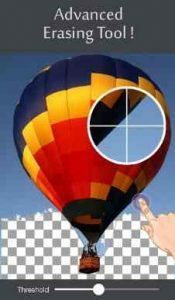 Background Eraser and Remover : With Background Eraser you can easily remove background from your photos & save the transparent image in Png or Jpg format! The resulting images can be used with other photo apps. Advanced erasing tool like Target Area, Target Color, Brush Tool ! Save as Png or Jpg format! So,what are you waiting for?Download while its free! its a good app, dont get me wrong. but it doesnt wprk well with line art for drawing…. i wanted to use bases to draw my fursona as, but some dont have transparent backgrounds. so when i put it in my drawing app, alot of lines dont turn out well. so i tried using this to maybe fix the background…. it works well, yes… but it leaves A TON of pixels around the lineart so its pointless to use this for lineart. maybe if they change that so its easier for lineart, so it erases ALL the white and doesnt leave anything behind. or they should add something where you can choose to keap on 1 color and everything else is gone. What I do so far is just erasing and then switch to snapseed for double exposing. As I am just beginning to edit this app is easy to use and figure out. One problem though, having trouble finding saved pictures, not always easy to find. If you need an area just white or transparent this is the app for you! The only thing is that this app doesn’t do any other colors than just transparent and white. I looked through a lot of apps, and they didn’t do what I wanted, this did. Great! Omg I luv it sooo much!!! It helps me with all my edits for all my fanpages. There is only one concern, sometimes it has little white stuff that ruins the photo so I have to redo it but all in all its great you should get it. Great app. Easy to use and figure out. It would be nice to be able to erase all the background from intricate pics like trees where the sky is coming though in slivers. As it is now, each individual sliver must be removed which can be very time consuming, if not, impossible also if the sensitivity level of auto mode would stay set at where I set it until I change it, that would be nice to. It’s annoying to have to keep resetting it each time it’s pressed. Finely, the icons for upload and save are confusing.